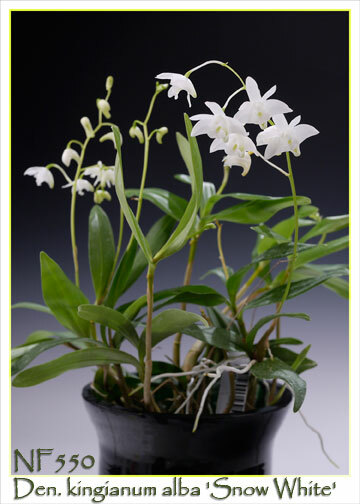 A delightfully sweet raspberry fragrance graces this temperature-tolerant Dendrobium species ! This rare alba strain is a more compact grower, with lighter green foliage, than the more common pink form. 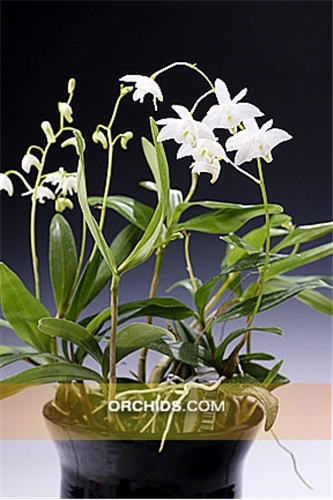 Producing up to 15 flowers, about 2.1cm in size, on each compact 6” apical spike, this vigorous and easy growing little species is extremely temperature tolerant. At our nursery in southern California, we grow them outdoors in temperatures ranging from 110o F down to a low of 35o! From late winter through spring it bursts forth with multitudes of gently dancing white flowers gracefully held above its foliage. 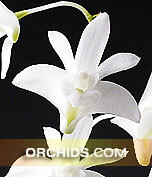 A good beginner’s orchid, it can readily reach specimen size for the ultimate display. Highly Recommended !